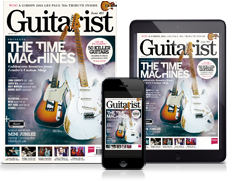 A mere month after revealing the Modern Double Cut and a raft of black ’n’ gold limited-editions, Gibson Custom has dropped the ultra-bling Ultima ES-335 and Les Paul. While the Ultima Les Paul has appeared in various guises, this is the first time the ES-335 has received the Ultima treatment - and on an Inverness Green finish to boot. Both models are kitted out with pearl/abalone tree of life patterns, as well as pearl binding, pearl-capped Grover Imperial tuning machines and gold hardware throughout. Elsewhere, the limited-editions pack 57 Classic humbuckers and ebony fingerboards; the 335 features a laminated maple body, while the LP offers a solid mahogany back with highly quilted two-piece maple top. 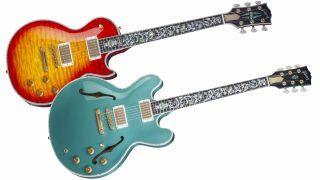 Sure to be collector’s pieces down the line, the pair are priced as such: $7,999 for the ES-335, and $8,999 for the LP. Head over to Gibson Custom for more info.